Every once in a while, I like to do a post on a brand that I really love right now, so I need to admit something — I love Jennifer Aniston’s hair. I’m all about it. Her hair always looks so incredible! This sulfate-free, silicone-free and oil-free conditioner works wonders, I swear. It adds smoothness, volume, moisture, strength and polish to your hair, plus this conditioner actually improves the quality of your hair over time. It also claims that you will wash your hair less over time, but I don’t necessarily believe that claim. I have super-blonde hair, and it basically needs to be washed every day, or at least every 24 hours. I’m such a conditioner-junkie, so I’ve tried a lot of them, and this one stacks up pretty well! I’m very impressed with it, and it has improved my hair’s split ends and frizz. Of all of the products featured here, this one is not my absolute favorite, but it’s definitely great quality and good for everyday use. Spoiler alert: this is my favorite product of the four I’m discussing here! The Prime Style Extender Cream is basically a hair primer – it extends the life of whatever style you have in your hair without weighing it down. It also protects your hair from the elements, and is sulfate-free, silicone-free and oil-free. Why do I love this product? 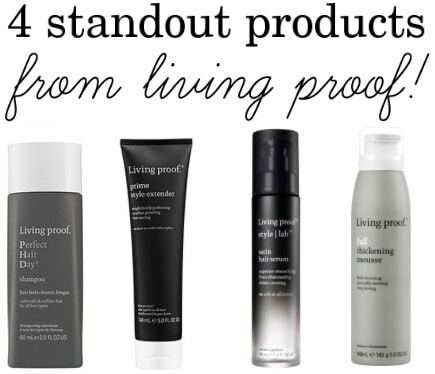 It’s basically an everyday perfecting product that adds no extra bulk to your hair and makes it beautiful. I noticed a huge change in my hair’s natural texture when I used this product, and I actually like the way my hair looks when I don’t straighten it. That’s huge for me, so this product is a big win in my book. This is the priciest item that I’ll be featuring, but you only need to use the tiniest drop each time, so you’ll get a lot of bang for your buck. This is basically a shine serum, but it also smooths your hair with no oils or silicones – just like the other Living Proof products. I love to use this product when I straighten my hair, and since you can use it in wet or dry hair, it’s perfect for touch-ups. I also use this serum when I put soft waves in my hair, because it adds some depth to the waves. Remember, don’t use a lot! You only need a tiny amount to get results. This is the product that I knew would give me Jen Aniston’s hair. I could just feel it. So I picked it up, and tried it the next day. I applied this product like any other mousse, blow dried my hair with a round brush – not too well, might I add – and after I was done fixing it up, I swear it looked like I got volume extensions. This mousse is something else, I’m serious! Even the next day, my hair still looked great. If you’re looking for natural-looking volume, pick up this product. It doesn’t give you the crunchy feeling that some mousses do, and it just looks like your hair, but better, if that makes sense. I highly recommend giving this mousse a try. What hair products are you loving right now? Do you use any of these? Would you like to see more posts like this in the future? Remember to tell us your thoughts by leaving a comment!